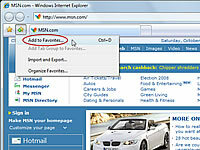 1Click the Add to Favorites icon on Internet Explorer’s toolbar. A little menu drops down. 2Click Add to Favorites from the drop-down menu and click the Add button. A box appears, offering to name the Web page by its title — the words that appear on the tab at the page’s top. Feel free to shorten the title so that it fits better on the narrow Favorites menu. When you’re happy with the name, click the Add button to add the page to your Favorites list. 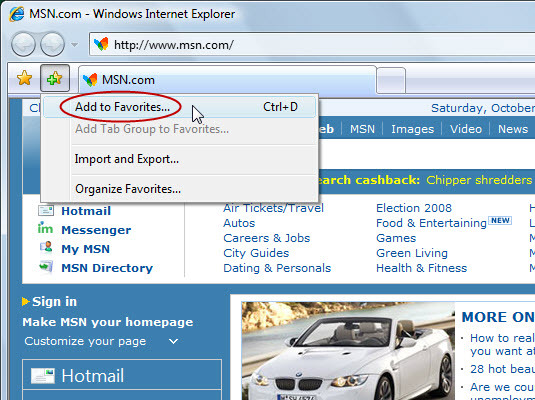 Whenever you want to return to that page, click Internet Explorer’s Favorites button. When the Favorites menu drops down, click your favorite site’s name.